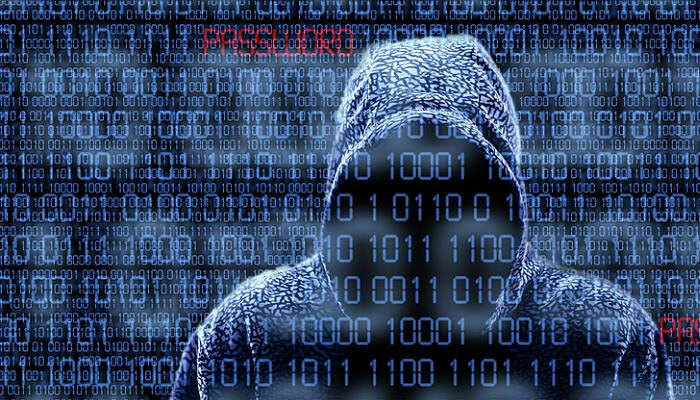 Hmmm...not a good start to the day with an automated phone call from the credit card company asking about a payment request this morning for a large sum of money. Happily their system works and I confirmed I hadn't authorised any such payment. Payment wasn't authorised, card stopped and a new card will be sent out to me. I only ever use the card for payments on line for modelling stuff but I had used it t'other day to order a takeaway meal via just e@t. That will be the last time I ever use that although I prefer to home cook Indian food so this is an added incentive to do so! I never use the card in shops and the biggest purchase over the last year using the card amounted to sixty quid. Having my fingers burned with extended credit in the past I pay the card off in full each month which tells how little I spend on it. 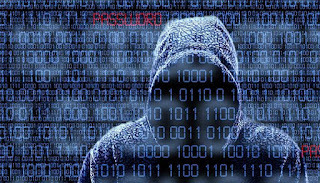 But it protects any purchases made on-line particularly with evil bay. A quiet day spent doing very little as the past week at work has been extremely busy with an emergency to attend to on Friday. Happily, we quickly dealt with that although as always the attendant paperwork took up a lot of time. But working in a small team with limited resources means the slightest thing not going to plan leaves us stretched very thin. But I also did my usual trick last night of staying up far too late with the headphones on, listening to music and a couple of beers with assorted cats on or around me as I dozed off in my favourite armchair. The clocks also fall back so my internal body clock will take a few days to adjust. It is properly autumnal now with that edge of winter with yesterdays sleet and cold winds. Time for the scarf and hat to come out and I love walking in this weather so some walks to be arranged. Back to putting my feet up, enjoying a good book and the last of my illusory freedom before returning to work tomorrow. Modelling brought to an abrupt halt. Mindy has discovered the new blinds taste as lovely as the previous bamboo ones despite being made of aluminium. She's sulking after Mrs C shouted at her. Look at that innocent face. Now for the darts on TV. The trip to the DIY shop has, thankfully, been rescheduled by Mrs C until another month as we need to properly measure up the fitting, choose the right sink, taps and other assorted plumbing bits as well as find a good plumber. Instead of the DIY shop I found out from a fellow modeller on a fb forum that a local shop was selling models, paints, etc...I didn't need any further prompting as we popped in and I restrained my urge to buy lots of models. 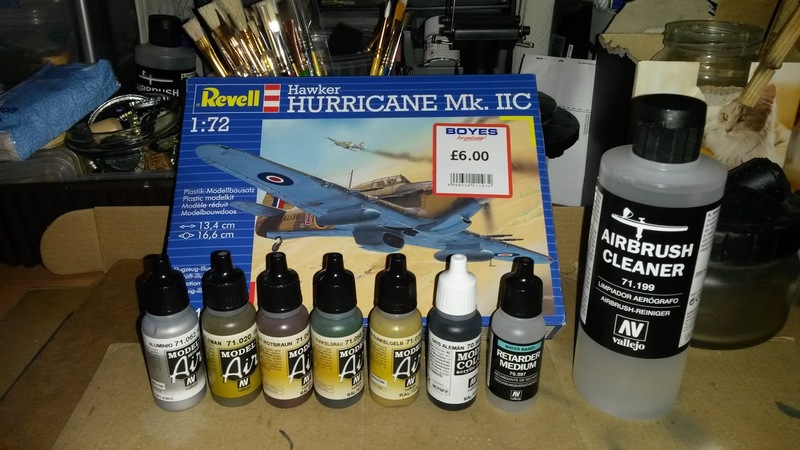 Just the one aircraft, some paints and paint retarder and airbrush cleaner. As a cheapskate I have saved the details from fellow modellers about making homemade thinners and cleaners rather than buying what is an expensive item. Below is the photo of the two completed models of the F4F-4 Wildcat and the Boulton Paul Defiant. Lovely builds and ordinarily quick builds but I have only the weekends for model making. 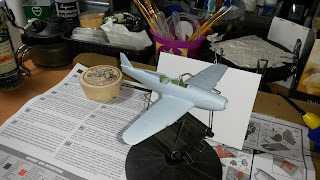 Mrs C saw a model of the Memphis Belle B17 in the shop and she asked me to build one for her in the near future so I am haunting evil bay for a cheap 1/48th scale kit. That will test my modelling skills and I aim to complete one for the next spring. I have used an old gardening seed germinator lid to create an extra shelf and I will buy some cheap lights to install as it's difficult to see what exactly is in there. I have a second lid to clean up and I'll add that to another shelf. The cats savaged the trawler I built so some gluing and repairs are required as that is next to Mindy's favourite sleeping space...a cardboard box of sanding grits! I can't blame her as both the boys are curious and knock things over. I also finally got more gardening done with the final grass cut for this year, some weeding and some pruning completed. More to do and that should prepare the garden for what is being predicted as a cold winter. I intend to finish off preparing the raised bed and then covering it with old cardboard to warm the soil up ready for next spring. I would like to get another bird table in but with three agile and one clumsy cat I'm not sure it's a good idea. I will look for an extra tall one but even that might not deter them. All in all a relaxed and productive weekend. Now to persuade Mrs C to visit the new pub The Taproom as I do like to support local small businesses. A quick update on progress so far and it is nearly complete! A couple of small parts to attach, a spray of pledge to protect the paintwork and decals, some light weathering and it's all done. A lovely and simple build. The airbrush is working after a thorough clean through twice to make sure so I don't have to buy a new one until next year (Fingers crossed!). The past week at work was extremely busy and we had the CQC (Care Quality Commission) visit which certainly put the managers on edge. It went well and hopefully we will pass with flying colours. An extremely busy and eventful duty day for me involving representatives of the law but all in all the week flew by. Last night saw me with beer and a good book as I'd had enough of computers and TV. This delightful book which I helped fund earlier this year was delivered and I am dipping in and out of it. I tend to read crime / detective novels and other assorted 'low brow' literature but occasionally I up my game and so far this is an excellent read of short stories. With work adding much needed structure to my week I have settled into a familiar routine. Although Thursday night I was wide awake at 3 a.m. and for the life of me I don't know why. Hence yesterday was a busy, long and tiring day at work but a very satisfying one. The routine now for a Friday night is a couple of beers and a good book. There is a new pub opened up near us attached to a new brewery and I intend one Friday evening to pop my head in. Mrs C isn't interested because it isn't situated in the nicest of areas and she doesn't fancy running the gauntlet of drug dealers, users, drunks and other assorted denizens of the night. Anther picture before I go and I will now consider the next build and plan to start that next weekend. I'm not sure if I'll have much time tomorrow as Mrs C has rightly pointed out that the new kitchen sink I promised to shop for hasn't yet made an appearance. The old one has a leak around the plug as the ceramics is cracking. My gimcrack slapdash approach of waterproof filler isn't doing the trick so I will be visiting DIY shops tomorrow. New sink, new trap and possibly new taps and that's before I consider hiring a plumber. It is a good job the airbrush works and will have to work for a few months yet! I spent some time yesterday starting on a new build as I was keen to crack on with this kit. That's my cheap airbrush disassembled for the second time with airbrush cleaner, the brushes, etc...as the airbrush worked briefly but as soon as I changed paint it stopped working. Despite lots of thinner the mixture would not go through. I spray very thinned light coats of paint and I was hoping to add some light contrasts with light grey paint and then another light spray of black paint on top of that. With different shades of black I hope to add depth, texture and contrasts so that it does not present as a flat black colour. I will try again over the next couple of days but I suspect I need a decent airbrush and compressor. My current one is a cheap kit I bought for about thirty quid on-line. A reasonable entry level airbrush and compressor starts at about £130 although I have found a good combo for about £180 so I shall be budgeting for that in the next month or so. I can't complain as my cheapo airbrush has lasted over two years and gave a sterling service. I guess I will be brush painting during the interim which I enjoy and pushes my skills in another direction. My plan is to stay in this job for the next five years and earn money to live and enjoy life. I really don't want to go through another period of unemployment, applying for jobs and fretting about money so perhaps I have learned a valuable lesson. This will ensure things like the mortgage are paid off and necessary work completed on the house. But I want to enjoy life and the time I spend at work and having a camper van for work and play will help. Looking back through my blog and the same theme of going to Hadrian's Wall, Whitby, historical sites, etc...comes up and every year I don't go. 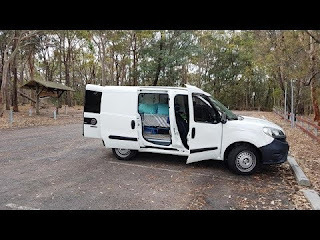 I am lazy and I am also a homebody who prefers to spend money on my cats and modelling but, sometimes I miss the obvious and exchanging my car for a camper van seems like the obvious solution. I'm also aware that part of being a lazy homebody is an excuse for dealing with my anxiety and avoiding going out, which is ironic as I spend a lot of time doing anxiety management with patients! 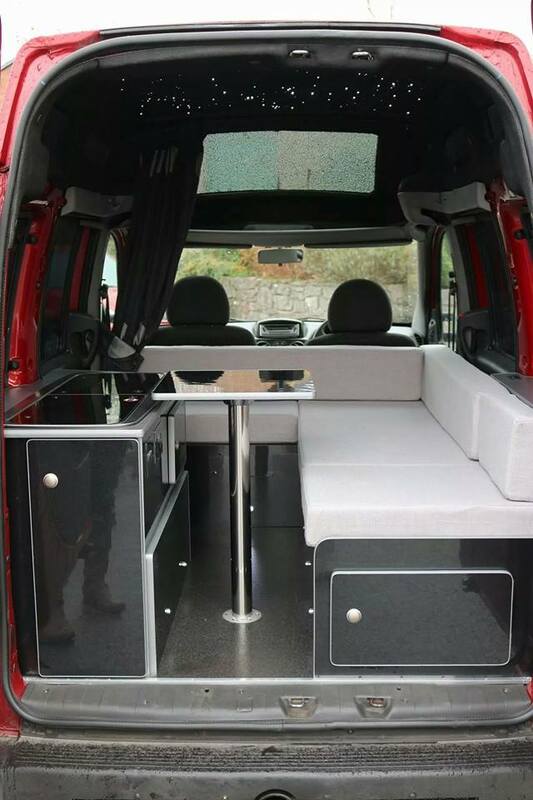 So no excuses, I'll be saving up, pricing up camper vans and loans and before the spring I intend to have sorted out a 'new' small camper van which will cope with commuting, work mileage and trips away. I like the idea of lunch breaks consisting of camper van picnics in scenic spots between visits. My latest build nearly completed this afternoon. Some more paint touch-ups to do, a light wash and the aerial to finish off this F4F-4 Wildcat. Sundays are now my modelling day although chores and odds n sods* to complete eat into that modelling time. We put some new blinds up today on the front window to ensure more privacy. Mrs C. reported two recent incidents; the woman who stopped and looked straight into the widow, waved at Mrs C and wished her a good morning was the nice incident. The homeless man off his face on drugs shouting at her another morning was the unpleasant encounter. So, privacy blinds up and hopefully we will have fewer gawpers stopping to stare in. Don't these people have televisions or computers they can gawp at? The weather is decidedly odd at the moment, with warm days and cold nights. The latter I can certainly feel in my bones and I've started to add the layers. As an almost officially auld bugger I can recommend those extra layers and thermals! The past week has seen me adding to my caseload at work and now I have access to all systems I am catching up on the inevitable paperwork! We hot desk at work so I don't have one nominated desk to work from and my back is a little bit more achey than usual. I might have to request a more supportive chair as although we are out and about, there are days when we might be tied to the desk for 2 - 3 hours at a time. Particularly duty days when one responds to all contacts and queries coming in to the team. On the home front No.1 son is again struggling with depression so he will be seeking help again next week. We discussed a possible plan to improve his life, that he stated he might study via the Open University and he will have better options for employment. He is considering studying physics as he enjoyed that at school and he is pretty good at maths. I have suggested he research his options and have a chat with the OU advisors regarding finances, etc...He knows I am considering a return to distance studying but nothing to do with health and social care as I can update my work knowledge skills from short on-line and real life courses. Classical studies and history are two options but I am also intrigued by fiction writing studies. There is no hurry for me and I will take my time looking at what is available. But I am settling in to a work routine and the rest of this year will be focused upon work with my days off focusing on modelling and reading my usual unchallenging rubbish books. 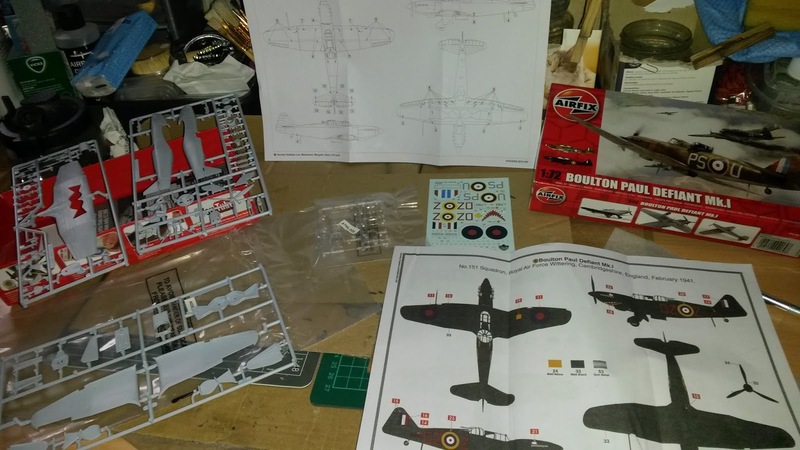 This is my planned next build, the Boulton Paul Defiant in 1/72nd scale from Airfix which has long been a favourite of mine. 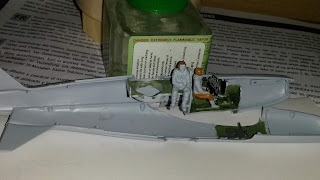 For a self confessed armour modelling guy I have been buying and building aircraft. The picture below shows some of the builds that will occupy me over the next few months but my problem will be where to display the finished builds. Particularly safe from feline inquisitiveness although touch wood I have been lucky so far. Anyhow, showered and prepped for work tomorrow, feet up, sasquatch podcasts to listen to and a mug of fresh brewed coffee will be my Sunday evening. I wish you all a good week to come.